I’ve seen these adorable little fabric pumpkins all over Pinterest and knew I had to try to make them myself! They are so easy to make! 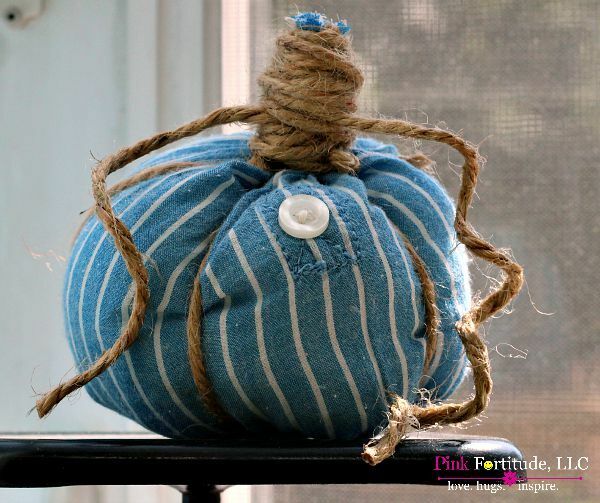 If you have any old shirts, sweaters, or come across a cheap yard sale find, this is a brilliant way to upcycle the fabric into these cute and festive fall pumpkins. Here’s how! This is going to sound complicated, but honest – it’s super easy! 1. Cut the shirt sleeve so it has two openings (think toilet paper roll). 2. Cut 6 strings of twine, a few inches longer than the sleeve. 3. Flip the sleeve inside out. 4. Pull the strings through the sleeve so that they are sticking out just a little on the other end. 5. Wrap the rubber band around the end of the fabric and string ends. 6. Flip back to the correct side out. 7. Using the fiber fill, fill up the pumpkin. 8. Once it’s full, use the twine equally spaced to gather at the top. 9. Wrap the top with a rubber band. 10. 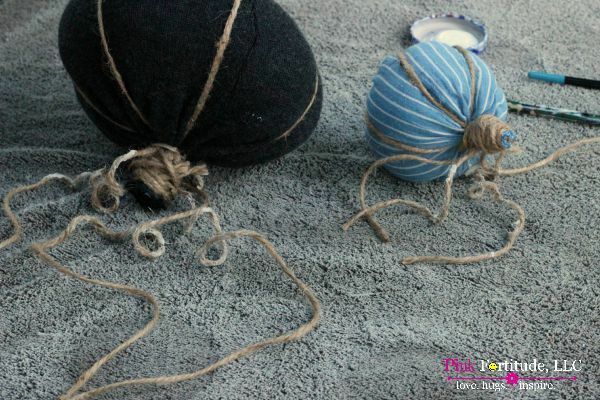 Using the leftover twine, wrap the top or you can use another piece. Leave 2-3 pieces of twine out as the tendrills. 11. Twist the twine tendrills around a pencil and brush with Mod Podge. 12. Let stand for a couple minutes, and then pull the pencil out. I didn’t want mine super tight, so I didn’t hold them together long (you can see in the second picture below). Just be sure to not let it dry too much and glue your twine to your pencil! 13. You can add leaves or ribbons, or any other embellishments that you like. 14. And because I can’t end on the #13, I will end with saying enjoy your fall decorations! It’s a lot of steps, but it’s easy, trust me! 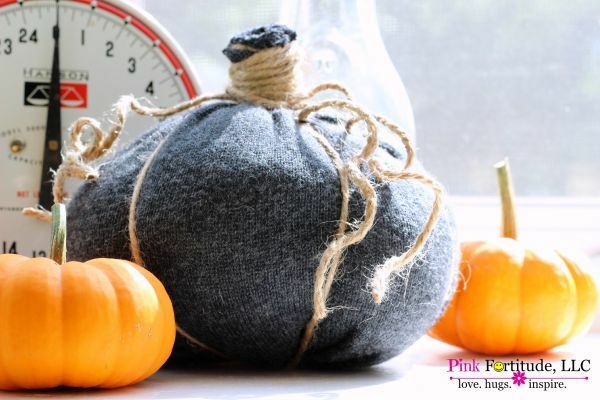 Hubby will attest to the fact that I can’t even sew a button, and I love the ability to make such a cute fall craft that does not require a needle and thread. These pumpkins are all over Pinterest this time of year! Are you going to make one too? The first pumpkin I made was from a button down dress shirt that I picked up at a yard sale a few years ago. I wore it out to the point it was not even worth donating. The button was on the arm of the shirt, and I wanted to include it as an extra embellishment on the pumpkin. The second pumpkin I made was from a gray sweater dress. I think I owned that dress for at least 10 years. It was one of those dresses that I could dress up to wear at work or dress down for the weekends and it was like wearing a big warm hug. But it was time for retirement, and I thought the sweater fabric would be a nice mix-up along with the chambray. My dear neighbor posted on Facebook about how she had all of these little pumpkins growing in her backyard. I may or may not have bribed her to swap some Lego’s for those cute pumpkins! I love how everything looks on the kitchen window. I can smile and pretend it’s fall when it’s still 90 degrees outside! Love, hugs, and Peter, Peter, pumpkin non-sewer. 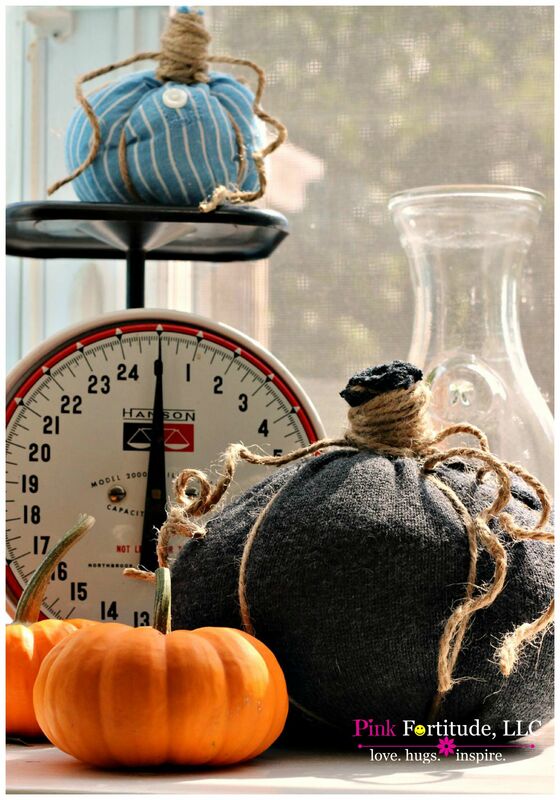 How absolutely adorable and your pumpkins are even better since I they’re made from repurposed clothing. I have a similar idea on my to do list. Loving, pinning, sharing! It’s that tiny button making the cutest striped pumpkin! Cute project! And I have to tell you that I love your vintage scale. Pinned! Who knew they were that easy?! Cute, cute! These are darling. Great job! Cool I want to try this. Come over and share at The Fabulous Fall Party. I am so going to make some of these! Thanks for sharing! These are so cute. I made some last year but I love the twine you did at the tops. Using old sweaters is a great idea too! Thank you for sharing at Merry Monday! These are too cute love the button showing on the little pumpkin! Thank you so much for sharing this pin on the P3 party Board! I love it and it will be featured on the blog and my social media tomorrow! So look for a little traffic from me! 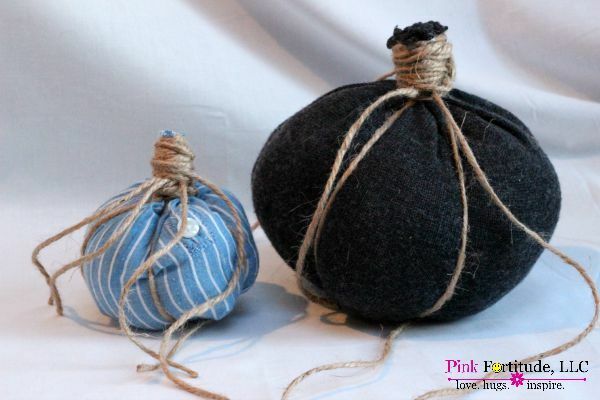 I love these no sew pumpkins! 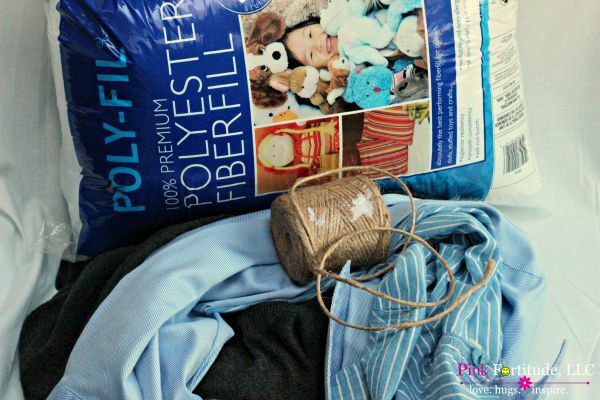 It’s a great way to repurpose old clothes or rags! Theses are adorable. And so easy. plus I have everything on hand. Pinned to make later. 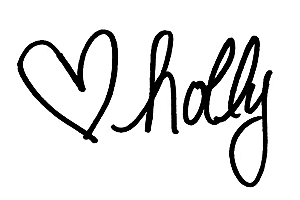 My kind of project – no sew!! I’d love it if you would share these on the Pleasures of the NW’s DIY link up! These are too cute! 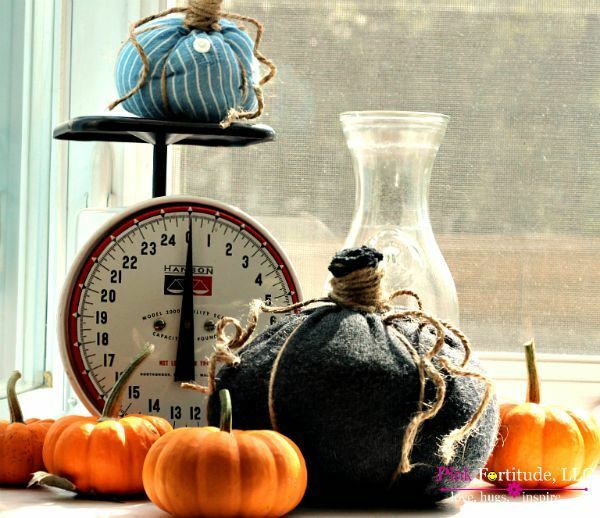 What an easy and pretty Autumn decor idea. Thanks for sharing your tutorial with us at Merry Monday this week! Super cute! Love the twine curly ques at the stem. Great way to repurpose something headed for the donation bin! Visiting from Recipe and DIY Party. Very cute and easy, too – my favorite kind of project! Thanks for linking up with Merry Monday this week; I’ll be featuring your pumpkins at our upcoming party. Hope you’ll stop by and link up again! These pumpkins are adorable. Thanks for sharing this with us at the Waste Not Wednesday link party. Hope to see you back again this week.